The three boys of I Not Stupid. The Skinny: With equal amounts of comedy and heartfelt emotion, Jack Neo's I Not Stupid succeeds as a biting social satire of the highly competitive Singaporean culture. 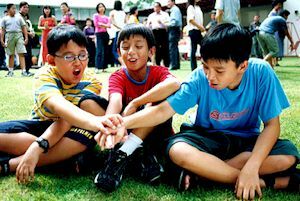 From Singaporean filmmaker Jack Neo comes this winning 2002 comedy, I Not Stupid, a film that illustrates the trials and tribulations of three young boys in their never-ending quest for good grades in Singapore's cutthroat educational system. As classmates in the undesirable EM3 category, the three boys are labeled by society as worthless, and the resulting pressure confounds the youngsters in all their attempts to improve. In many ways, the film is an allegory for the social realties of modern day Singapore. Our chubby narrator, Terry Khoo (Huang Po-Ju) is a critique of the stereotypical Singaporean. As the son of a wealthy Ba Gua (BBQ pork) tycoon, he's a spoiled child, so completely coddled by his mother that he is unable to think for himself. Terry's mother, Mrs. Khoo (Selena Tan) is a thinly veiled stand-in for the government, who passes out gifts to her children to stave off rebellion. Though her "mother-knows-best" mentality comes from a love for her kids, she invariably strips them of their freedoms in the process. Terry's friends Liu Kok-Pin (Shawn Lee) and Ang Boon-Hock (Joshua Ang) symbolize those students left behind in the dizzying, unnecessarily dire educational process. Though Kok-Pin is a talented artist, his inability to perform well academically causes people to look on him as a failure. And despite being unfairly labeled by society, Boon-Hock remains a hard-working student who strives to pull himself out of the EM3 chasm in his bid for respectability. Notes:  I Not Stupid became the second highest-grossing film in Singapore box office history. The number one film is Money No Enough, also written by Jack Neo.